More than 1.3 billion people speak some form of Chinese as their heart language. God's Word has been translated into Mandarin, as well as nine minority languages. But, there are 55 minority languages and an unknown number of dialects within each minority language. 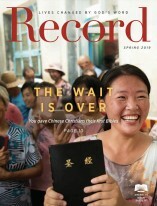 This means there are still millions of Chinese people waiting to hear God speak in their language. It is a task that translators have been working on for almost 1,400 years. One of the first translations of Scripture for the Chinese occurred in the 7th century. In 640 A.D., Nestorian (Persian) Christians first translated the gospel story for the people group they were trying to reach. But that was just the gospel story. In the early 16th century, the Jesuits reportedly started translating the Bible, but no trace of their efforts exists today. It wasn't until 300 years later that Robert Morrison, the first protestant missionary to China, completed work on a translation of the New Testament in 1813, and the full Bible in 1819. Translation, in general, is difficult work. Even with present-day technology, the average full Bible translation project takes about 12 years and double that in the past. Translation for the Chinese, in particular, was even more complicated. Part of the difficulty early translators encountered was China's advanced society. Not only did the Chinese have established religions & mdash; such as Buddhism, Confucianism and Taoism — but those religions were already well-documented in literary and religious texts. Christianity entered China as a completely foreign religion. In addition to multitudes of languages, translators encountered problems with the script used by the Chinese. That issue wasn't resolved until 1885, when Sam Pollard, a missionary from the United Kingdom, developed a script for the Miao language. The script he developed used the initial consonant of a syllable with the vowel placed above or below it, indicating the tone of the vowel. This script, now known as the Pollard script, allowed him to translate the New Testament for the Miao in 1917. There were also other obstacles to overcome — significant issues like what to call God. Translators agreed that they wanted a term that connoted God's character, his history and deity. Some translators favored using an indigenous term for the divine. Others wanted to borrow a term from another language. The choice seemed to narrow down to the indigenous term “shen” or the borrowed word, “shangdi.” While shen was the true translation of the biblical God, it had no historic meaning because the Chinese had never had a monotheistic faith, says Noss. Shen actually referred to the highest class of Chinese gods. By the late 1800s, the earlier translations were proving difficult for people to comprehend. In 1890 working began on the Mandarin Union Version Bible using Mandarin — the language used across China and taught in schools. It was completed almost 30 years later in 1919.